Access apps are built to be used in a browser for easier sharing and collaboration. To create and use an Access app you’ll need Access 2013 or higher and an Office 365 for business site or a SharePoint Server 2013 or higher site. Here’s more on creating an Access app. Let’s take a quick look at ways you create an app, add data to it, and some possible next steps in customizing and using your app. If you’re more interested in working with an Access desktop database, see Basic tasks for Access desktop databases. It’s faster to start with one of the app templates that come with Access. 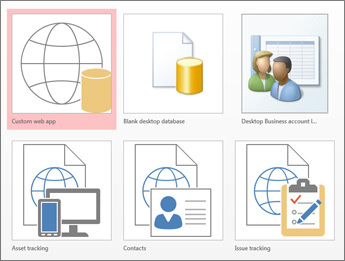 Templates with the word “desktop” in the title will create traditional Access desktop databases. Click a template and enter a name in the App Name box. Select a web location for the app and click Create. 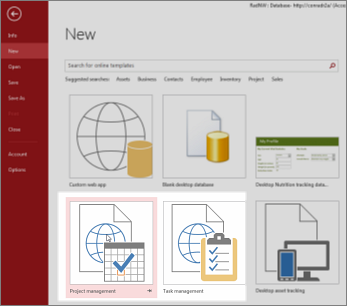 Learn more about starting your database from an Access app template. For more details about finding the web location to use in the App Name box, see find a web location for your Access web app. If you’d rather design an app on your own, continue to the next section. If none of the templates fit your needs, you can create an app from scratch. Open Access and click Custom web app. Enter a name and the Web location for your app (or pick a location from the Locations list) and click Create. For more details, see creating a custom web app. Regardless of whether you started with a template or a blank app you can always customize an Access app. Open your app in Access (or from the browser, click Settings > Customize in Access), then click Home > Table. On the Add Tables page, pick your source from Create a table from an existing data source, and follow the steps in the Get External Data wizard. For more information about importing data, see Import data from an Access database into an Access web app. To create relationships for the new table, you would add lookup fields.